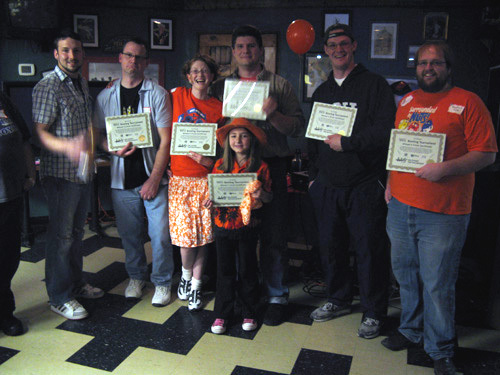 Strike out MS by participating in a local Wii Bowling Tournament and chili cook-off! When: Saturday, March 12, 12 P.M. - 5 P.M. This weekend, Team N3kk1d is proud to present its 2nd Annual Wii Bowling Tournament in celebration of National Multiple Sclerosis (MS) Awareness Week, happening this Saturday, March 12th from 12pm-5pm at the CWA Local 4034 Hall. Admission is only 10 bucks and for that low, low price you can try out varieties of different chilies (which includes meat and vegetarian options), compete in the Wii Bowling Tournament, crafts for kids including a piñata, a live DJ and a whole lot more. In addition, there will be raffle and beer tickets for sale to try out a local micro-brewery beer. There is even a costume contest, so come dressed as orange as humanly possible to “Strike out MS!” There are prizes and awards will be given to winners in the tournament and chili cookoff. All proceeds from the event are donated to Michigan chapter of the National MS Society. Last year, Team N3kk1d raised over $6,000 for the Michigan chapter of the National MS Society. Founded by the wife and husband team, Steph Ford and Sloth, for nearly 15 years Team N3kk1d and its family of teams have worked tirelessly fundraising for the MS Society. There is a new diagnosis of MS almost every hour and approximately 400,000 people in the US live with the disease, with over 2 million people affected worldwide. There is no cure. According to Sloth, even as little as 20 years ago there were no drugs on the market to alleviate the symptoms or slow down the progression. Thanks to fundraising and research, there is now close to half a dozen drugs available for MS sufferers, with more on the way. Some of Team N3kk1d’s other events include providing cyclists for the West Michigan Bike MS event every June, runners in 5th 3rd River Bank Run in May, and walkers for the Challenge Walk MS every fall. If you’re unable to make the event this year but would like donate or volunteer in some capacity, Team N3kk1d is always looking help. You can make donations directly to them or contact Steph or Sloth for additional information to volunteer.